Historical Tapestry has had a lot of fun with all of our activities so far this year; so we knew we had to bring you another one. The 100th Anniversary of the start of WWI and the terrible events that conspired is only a short time away and the publishing world is getting ready for the attention this event will garner. We at Historical Tapestry thought this would be a good time to dedicate two weeks to books and authors that cover the event. 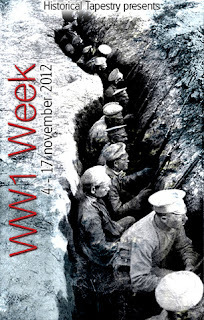 So, be sure to tune if for two weeks of WWI events! I'm looking forward to reading the posts you have planned as I've recently become more interested in reading about the WWI era. I'm a big fan of books about WWI so I'll definitely be looking forward to your posts! just added the NOVember link to my WWI read, RIlla of Ingleside - as told from the view of women at home, by Anne of Green Gables Canadian author, LM Montgomery..